11 entertaining stories about everyday themes written using a wide range of vocabulary and diverse grammar structures. A total of 1,000 new Spanish vocabulary items including some colloquial terms spoken in everyday Spanish conversations. Learning aids and extra features to boost your comprehension: questions at the end of each chapter and short summary to check for understanding. Free audio in Spanish and English to improve your listening skills. 3 formats available: PDF, EPUB. Reading is the key to improving your comprehension skills, and helps you formulate better sentences. But when you’re still a beginner or intermediate-level learner, it can be difficult to find proper materials to practice reading. You will also need to consult a dictionary while you’re reading, and without an audio accompaniment, you will find it difficult to learn new words and how they’re pronounced by native speakers. For new Spanish-learners, reading and listening to short stories can be a fun and painless way to learn Spanish. 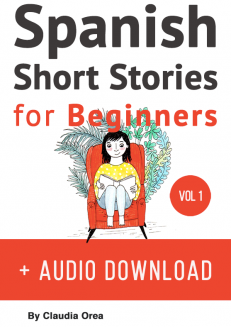 Short stories will introduce you to new vocabulary and sentence structures, while the accompanying audio material will help you with listening comprehension. Improve your Spanish without the monotonous chore of memorizing grammar rules. Learn new vocabulary that you can immediately put to use in everyday life. Practice your listening skills by listening to a native Spanish-speaker narrating the stories. 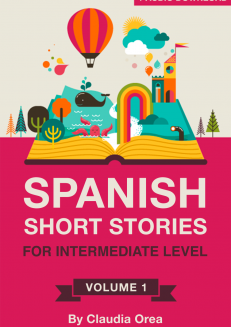 This ebook makes use of simple yet entertaining stories to help you learn Spanish. By covering a diverse range of grammar structures and vocabulary, and supplementing it with audio, you can improve your reading and writing skills, and even practice your listening and pronunciation. 11 entertaining stories about everyday themes: short enough to hold your attention (1,500 words in length), but long enough to make you feel a sense of accomplishment and progress after finishing each one. A total of 1,000 new Spanish vocabulary items, including some colloquial terms spoken in everyday Spanish conversations. Free audio to improve your listening skills in Spanish and English. The ebook comes with a Spanish and English glossary within the stories themselves, so there will be no need for a dictionary to help you with words you don’t understand. No need to go back and forth to translate or look up words you don’t understand. 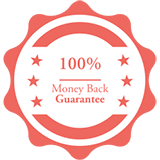 With the help of the free audio, you can give your listening skills a boost as well as practice your pronunciation. Recorded by a professional voice talent from Madrid, Spain, the stories are narrated using a standard Spanish accent and slightly slower speed than how actual Spanish people speak. 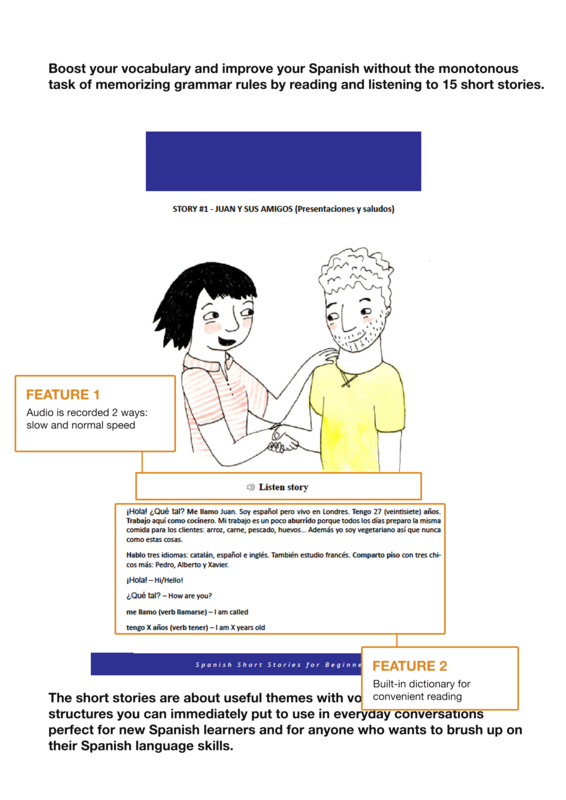 This will allow beginners and low-intermediate learners to grasp the narration properly. Extra care has also been given to the recording of the audio to ensure a pleasurable listening experience for learners. ​Questions at the end of each chapter: to promote comprehension. ​A summary of the story: after each chapter, you are encouraged to write a short summary of the story, and you can compare it to the provided summary, to check for understanding. This e-book contains a total of eleven short stories that revolve around the following daily themes: movies and cinema, ordering in a restaurant, family, crime and police, daily routine, physical descriptions, vacations and holidays, and more! 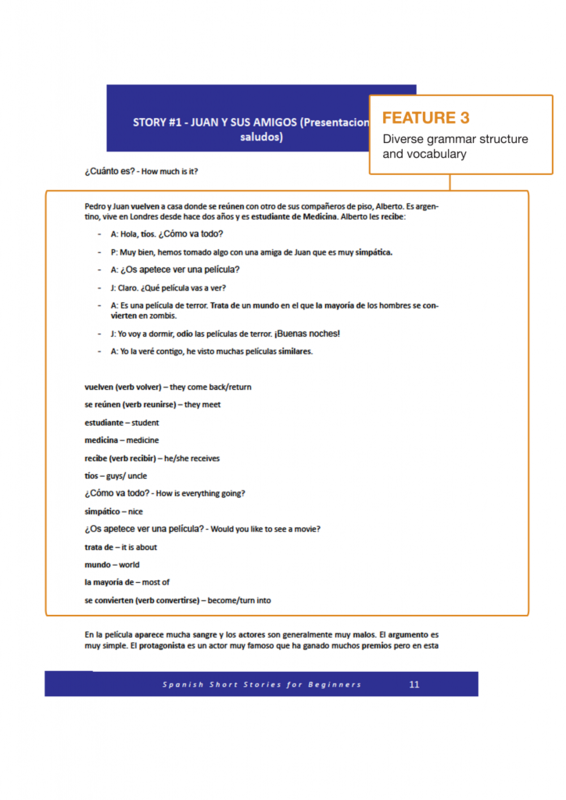 The stories are written using a wide range of vocabulary and diverse grammar structures. The carefully selected combination of dialogue and descriptions is especially suited for beginner to low-intermediate learners. Is This E-Book for You? A beginner or intermediate learner who’s looking for a fun way to learn Spanish. Fond of reading short stories. 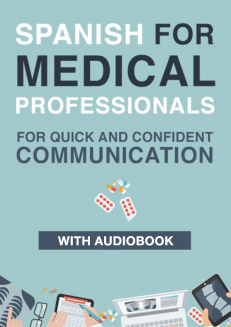 Looking for an e-book with audio that you can listen to everywhere. 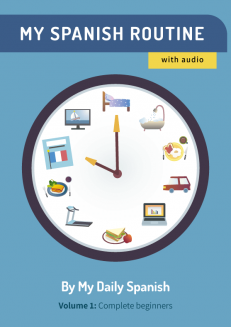 So, whether you are learning Spanish for business or for pleasure, thanks to this ebook, you can now immediately put to use what you have learned and sound more natural in Spanish. Ready to start learning Spanish? Grab your copy and get started today! It was a great read for a beginner like me. Extremely helpful book. The stories are on a variety of subjects from greetings all the way to criminals and police. The stories are definitely entertaining. 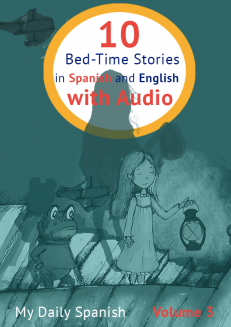 The book also has everything you need to learn Spanish efficiently, audio, text, clear native voice, translations, instructions, and quizzes at the end of each story. Very well put together. 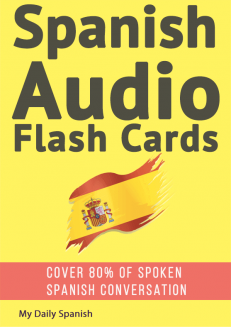 I’ve studied Spanish during one semester, and I found this audiobook a practical way to enhance my vocabulary and review some of the things I’ve already learned. The PDF version was also really helpful. I especially recommend it for someone who wants to have a general idea of the language. 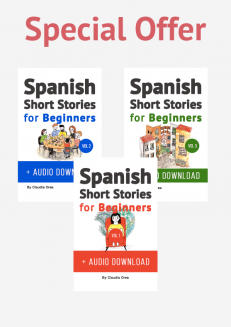 These short stories helped me improve my Spanish listening and writing skills. 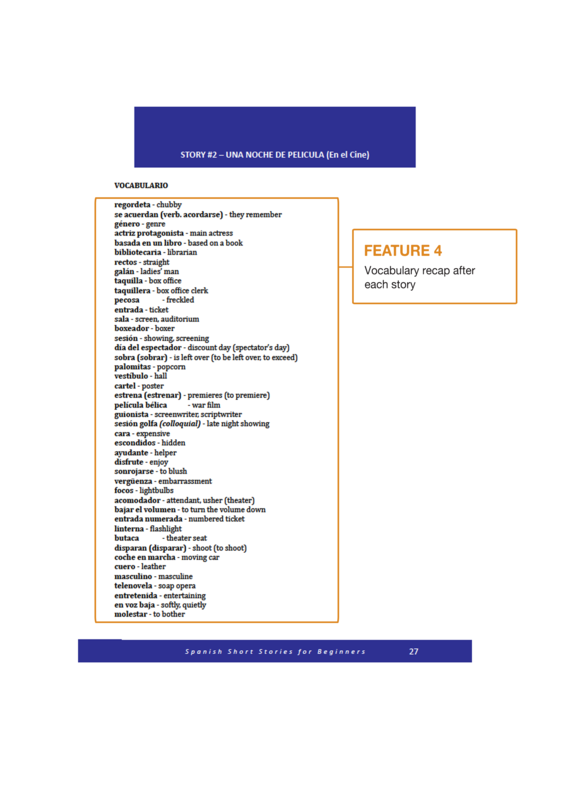 Once I understood the format of the audiobooks, the vocabulary reviews were very helpful. I am a beginner at the Spanish language and could understand most of the stories. It’s easier to dissect the words in these shorter stories. Great stories as well. This really improved my verb conjugation and broadened my vocabulary. It is a very good book for beginners, because it tells stories that depict different realities of everyday life and still has excellent audios accompanying the book, allowing us to better understand some particular characteristics of the language besides a great translation of vocabulary into English. I think its very good, reading more than recommended for those who want to learn spanish. 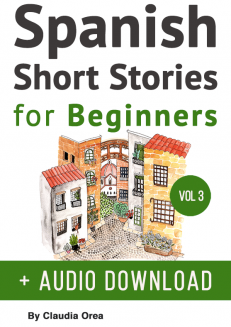 I bought Spanish Short Stories for Beginners to help my younger brother practice Spanish. We have really enjoyed listening to the audiobook and reading the stories together. It has helped both of us improve our Spanish! 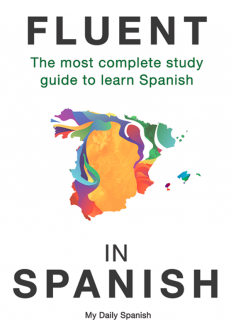 The book is a good refresher on vocab and grammar for people that have some knowledge of the Spanish language already, and a good start for people trying to learn the language. I like the small quizzes at the end of each story and their summaries, in English. I just hope that the book would have more pictures and illustrations to make the stories more interesting and colorful to the see and read specially for children that are just starting to learn Spanish. It has interesting and surprising stories. It’s great to catch the attention of those who are learning. The stories were actually interesting, but simple enough that a beginner like me could follow along.